You can select up to 13 travelers in total. Enjoy sweet treats, train rides, and underwater reefs during this multi-stop, family-friendly, full-day, guided tour. Indulge in tea and sweets at an award-winning bakery before setting off to be a kid (or an adult) in an actual candy store. See taffy being made and sample multi-coloured chocolate, fudge, and candy confections made onsite. 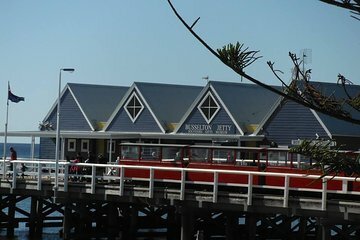 Ride the red train at the picturesque Busselton Jetty to see artificial reefs at the Underwater Observatory. We had a wonderful time on this tour from start to finish. A very family oriented tour suitable for all age group. We loved the company of the 4 angels that came along on the tour. The bakery stopover was a pleasant treat that you should not miss.